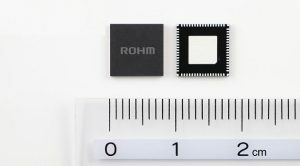 ROHM announced the availability of a programmable system power management IC (PMIC) optimized for NXP Semiconductors’ i.MX 8M family of applications processors that excels in processing audio, video, and graphics in a wide range of applications, from home audio/video to industrial automation and mobile computing. 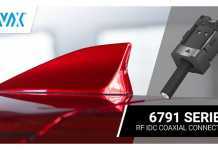 BD71837MWV integrates all power rails required by i.MX 8M processors and system peripherals. In addition to a high-efficiency buck converter that provides a maximum conversion efficiency of 95%, most protection functions required by the system are included, making it possible to significantly reduce the development time, decrease size, and simplify system design. In recent years the emergence of IoT has allowed electronic devices such as smart speakers to interact with users through voice commands for streaming audio/video. 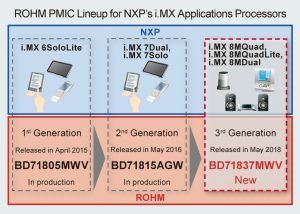 NXP’s i.MX 8M family integrates up to 4 Arm Cortex-A53 and Cortex-4 cores and offers flexible memory options along with a high-speed connectable user interface. Additional features include full 4K Ultra HD and HDR video functionality, high-fidelity audio playback, up to 20 audio channels, and support for DSD512 audio. This highly integrated design combines audio, video, and machine learning in a single platform to provide seamless connectivity and an intuitive experience. 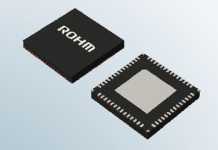 The power supply circuit of the BD71837MWV, designed specifically for the power supply system of the i.MX 8M processor family, integrates an 8 buck converters, 7 LDOs, and control logic that allows it to supply power not only to the processor, but the required DDR memory as well – all from a single chip. 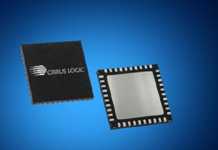 A 1.8V/3.3V power switch for SDXC cards is also built in, along with a 32.768kHz crystal oscillator buffer and multiple protection circuits such as output short-circuit, output over-voltage/current, and thermal shutdown. 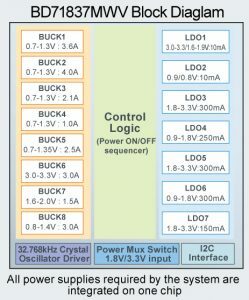 Buck conversion efficiency from 83 to 95% is achieved for 0.7V to 3.3V output, and the wide input voltage range from 2.7V to 5.5V supports a variety of power sources, from batteries to USB, making them ideal for i.MX 8M applications. The BD71837MWV integrates a sequencer compatible with power modes supported by i.MX 8M processors (RUN, IDLE, SUSPEND, SNVS, OFF) to provide greater application design flexibility. 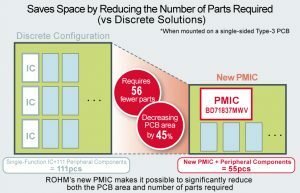 Furthermore, the power mode transition conditions, protection function enable/disable, and ON/OFF control and voltage for each power supply can be customized through the I2C interface and OTP (On Time Programmable ROM) for the memory type and functions required by the system, making it possible to achieve optimum performance based on application needs. For more information, visit rohm.com. Next articleHow could a multiplying DAC be used other than as a DAC?